During the Cold War, the US leaned heavily on the insane multi-mach speeds its SR-71 spy plane could achieve. This speed allowed it to outrun virtually every plane, anti-aircraft battery, and guided missile that the Soviets could throw at it. That is, until Moscow rolled out one of the fastest and most far-seeing planes in history: the MiG-31 Foxhound. The SR-71 had finally met its match. 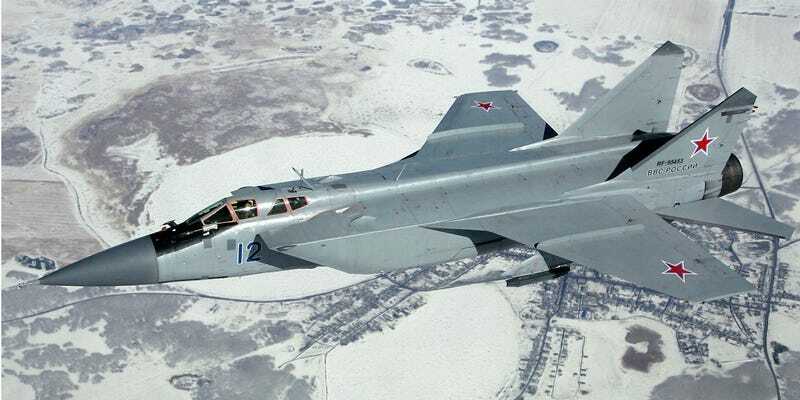 The Mikoyan MiG-31 Foxhound is a Russian-built interceptor aircraft—it's designed to go straight, very fast, in order to intercept and destroy invading planes—as a modernized replacement to the older MiG-25 Foxbat in the late 1970s and early 1980s. The main issue with the Mig-25s was the fact that they simply couldn't pull off low altitude supersonic flights—their engines just didn't have the power. The MiG-31's efficient low-bypass-ratio turbofan engines, however, allowed it to do just that. The 74-foot long two-seater features a 44-foot wingspan. Its airframe and wings are both far sturdier than the older MiG-25 design, which enables a Mach 1.23 top speed at low altitudes and a high-altitude observed top speed of Mach 2.83. The jet's design does allow it to break Mach 3, though doing so drastically reduces the operational life of its engines. Despite this speed, the Foxhound is not very good at making high-speed or tight turns, which limits its use as a dogfighter or air superiority platform. Instead, the MiG-31 relies on hit and run, flyby tactics. The MiG-31 entered production in 1979 and service in 1982. It was built largely in response to a pair of US technological advancements in the 1960s: the advent of strategic cruise missiles, which could be lobbed over the North Pole and fly low over the terrain while remaining out of site of Soviet satellites until they reached the USSR's doorstep, and the obvious radar gap along the Northern Russian border that would have enabled these attacks. So rather than build new terrestrial radar installations, the Soviets simply packed as much cutting-edge sensory capabilities as they could into the MiG-31. Dubbed the "Flying Radar" by its pilots, the MiG-31 carries the distinction of being the first aircraft with both a phased array antenna and passive electronically-scanned array radar. This allowed each Foxhound unprecedented detection capabilities—they can spot as many as 24 individual objects at a range of 200 km and track eight of them simultaneously, while the onboard computer determines the four most threatening pings and automatically locks R-33 long-range air-to-air missiles onto them. The four that the MiG doesn't destroy are then immediately targeted by anti-aircraft fire and Soviet fighter jets, thanks to the MiG automatically relaying their coordinates to HQ. Basically, if you flew within 200 kilometers—that's 124 miles—of a MiG-31, you'd be found out. And it's not just long-range tactical bombers that these Interceptors went after. With their extreme speed and sensory abilities, MiG-31s were easily able to interdict fast-moving targets that had until then simply outrun Soviet defenses: Cruise missiles and spy planes, specifically the SR-71 Blackbird. The SR-71, which used to fly over the USSR with impunity, was intercepted on numerous occasions beginning in 1986. In fact, the MiG-31's capabilities are so impressive that a number of defense analysts worry that neither the US nor any other nation has the air power to counter these impressive machines—and they won't have an answer within the next decade. All modern fighters (except for the fifth generation fighter aircraft) are not fully supersonic, since their supersonic flight time is limited to 5–15 minutes, due to various kinds of restrictions in the airframe design. Duration of the MiG-31 supersonic flight is only limited by the fuel supply. Moreover, the MiG-31 is able to pass the sound barrier in level flight and in climb mode, while the majority of supersonic aircraft pass the M=1 speed in a shallow dive.